This blog examines the structure of a competency more closely using the CompetencyCore framework as the basis for discussion. There are a variety of approaches for describing and displaying competencies. In their simplest form, a competency description includes the competency name (e.g. Client Focus) and definition (e.g., Providing service excellence to internal and/or external clients). But the real value of the competency is displayed in a set of Behavioral Indicators associated with the name and definition that demonstrates how the competency is to be displayed. Because these indicators are written as observable behaviors (e.g., Strives to consistently meet service standards), they can be used as the standards for measuring and assessing whether they are being displayed effectively by the employee. The competencies in the CompetencyCore framework are made up of several elements. The sample competency at the bottom of the page illustrates how these different elements fit together. The competency name and definition describe the competency and the essence of the behaviors it contains. The proficiency scale defines incremental degrees of proficiency for each competency. Problem Solving may be required for entry- and executive-level jobs within an organization, but the degree of proficiency needed at these two levels is likely to be quite different. As you move up the proficiency scale from level 1 to level 5, therefore, the required behaviors become more complex and strategic. The value of having a proficiency scale is that it allows the organization to map the different levels of proficiency required for different jobs and make comparisons across jobs. While proficiency levels often map to increasing pay grades or managerial / supervisory responsibility, this is not always the case. For example, jobs with high technical or professional demands may require higher levels of proficiency for those aspects of the jobs that the supervisory levels to which they report. So, when using this type of competency scale one should be cautious about automatically assigning a higher proficiency level with increased pay grade or managerial responsibility. The notion summarizes the overall theme of the behaviors identified within a given level of proficiency. A Behavioral Indicator demonstrates the use of a competency at a specific level of proficiency. Similar to the proficiency scale noted above, another way of displaying competencies is by level of expertise required. In the CompetencyCore library, our technical competencies (see next section on types of competencies) are shown this way with levels of expertise varying from “Basic” to “Expert” typically on a five-level proficiency scale. In all other respects the competency structure is the same, including displaying the behavioral indicators by proficiency level from Basic to Expert. Sometimes organizations decide to display their competencies according to organizational level. The same elements apply, that is the competency is defined in terms of the name and definition, but the behavioral indicators are assigned to organizational level (e.g., supervisor, manager, director, etc.). This most often occurs when the competencies are being used to support development for increasing levels of hierarchical responsibility, such as for leadership development. The CompetencyCore framework contains two main types of competencies. General Competencies describe the general behaviors, sometimes called soft skills, which are required to perform effectively. In terms of the definition of a competency, this type of competency is more closely aligned with the abilities, motivations or traits needed for successful performance. They are more general in nature and can be incorporated in a range of jobs within the organization. Thinking Skills (e.g., Critical Judgement). Leadership Competencies represent a subset of the General Competencies and include key competencies for roles that involve managing, supervising or influencing the work of others (e.g., Developing Others and Strategic Thinking). Technical Competencies describe the application of knowledge and skills needed to perform effectively in a specific role or group of jobs within the organization. These types of competencies are more closely aligned with the knowledge and skills or “know-how” needed for successful performance. 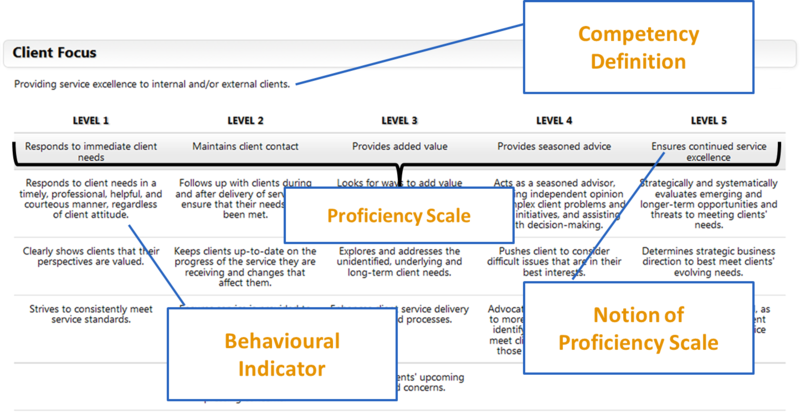 So now that you understand the possible flavors that a competency can come in, both in structure and in type, we can now look at how these elements are used within a general architecture (or blueprint) to develop Competency Models, also known as Competency Profiles, for jobs within your organization. The next blog in this series will discuss how competencies are used within a general architecture or blueprint for developing Competency Models or Profiles for jobs within the organization. Sign up to our blog’s mailing list through the form on the right-hand side to receive the rest of the series in your inbox.